Alfred Hitchcock was long known as the “master of suspense.” But it was writer James Allardice who helped mold the director’s image with the public. Allardice (1919-1966) wrote all of the introductions and epilogues performed by Hitchcock on Alfred Hitchcock Presents and The Alfred Hitchcock Hour. Norman Lloyd, still with us at 103, discussed Allardice in a 2000 interview for the Archive of American Television. Lloyd worked at a producer on Hitchcock’s television shows after being an actor in the director’s Saboteur (1942) as the villain who fell from the Statue of Liberty. Hitchcock’s creative team would send summaries of several episodes for Allardice. According to the Lloyd interview, Allardice sometimes didn’t even begin writing until a few days before the deadline but always delivered his work in on time. However, now Hitchcock himself was coming into millions of homes via television. No silent, momentary cameos like in his films. The director was now truly a performer. Because the two shows were anthologies, Hitchcock was the only face the audience could count on seeing every week. And it was Allardice who was feeding him his lines and establishing the settings. What settings they were. 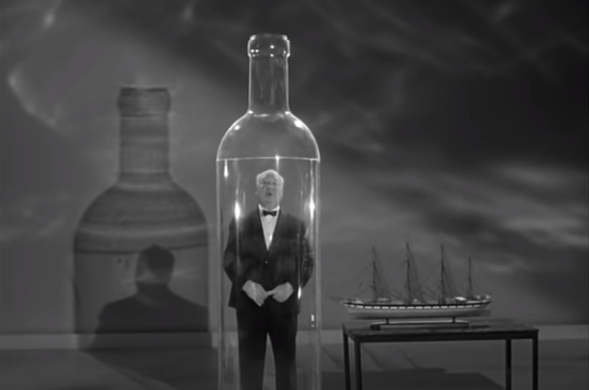 Hitchcock in a giant bottle. Hitchcock holding a ticking bomb, describing it as a dynamite-powered clock. Hitchcock’s brother “George” manipulating Hitchcock like a marionette (a dual role, of course). You can view an excerpt from Lloyd’s interview where he discusses Allardice below. 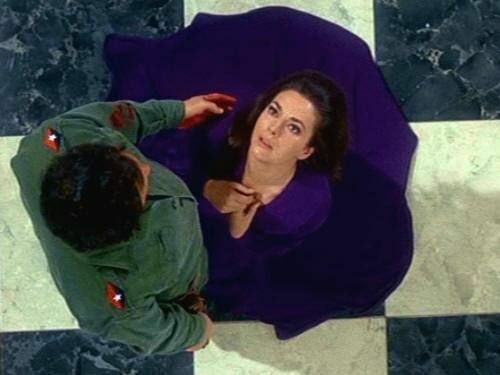 Actress Karin Dor died Nov. 6 at the age of 79. Obituaries, such as the one published by The Hollywood Reporter, naturally led with her status as a “Bond Girl” in You Only Live Twice. She played Helga Brandt, a SPECTRE assassin who is executed by Blofeld when she fails to kill Sean Connery’s James Bond. But that was not the German-born actress’ only brush with the spy genre. Besides Twice, her most famous spy role was probably 1969’s Topaz, directed by Alfred Hitchcock. She plays Juanita de Cordoba, who is involved in spying in early 1960s Cuba. Her character is killed by Rico Para (John Vernon) when her activities have been discovered. Her death scene involved some typically Hitchockian camera work. In this case, the camera is pointing almost straight down. Dor also appeared on the small screen in spy-related roles. She was a guest star on an episode of the Robert Wagner series It Takes a Thief, The Three Virgins of Rome. And she played the kidnap target of a Communist spy in a sixth-season episode of The FBI titled The Target. In the 1960s and ’70s, Universal’s television division was like a TV factory. Its shows had a certain look, a certain sheen. Universal’s TV operation would help launch the careers of people such as director Steven Spielberg and writer-director Steven Bochco (who both worked on the same episode of Columbo). Universal developed the concept of “the wheel,” where different shows rotated in the same time slow, or a series that had rotating leads. Examples: The NBC Mystery Movie (different rotating shows) and The Name of the Game (rotating leads). Universal, of course, still produces television shows. It’s now part of Comcast as is NBC, where many Universal shows were telecast. But it’s not the same because, naturally, television has evolved. Still, it’s a worth a look back. Origins: Music Corp. of America, or MCA, was a talent agency. But MCA saw the potential of television. It formed Revue in 1950 as a television production arm. It acquired the studio lot of Universal (then known as Universal-International) in 1958 and eventually acquired Universal itself. Revue produced all sorts of shows: Westerns (Wagon Train and The Virginian), comedies (The Jack Benny Program, Leave It to Beaver, The Munsters), crime dramas (M Squad), and anthology shows such as Alfred Hitchock Presents (hosted by Hitch), Thriller (hosted by Boris Karloff) and The General Electric Theater (hosted by Ronald Reagan). Eventually, all of its TV series were under the better-known Universal brand. The boss of MCA-Universal was Lew Wasserman, who became a major figure in Hollywood. Writers Richard Levinson and William Link, when devising the Mannix television series, came up with a character named Lew Wickersham (Joseph Campanella) who was modeled on Wasserman. Glory Days: Universal was a major supplier of shows for U.S. television. As early as 1964, it embraced the idea of made-for-television movies. Its first effort, The Killers, directed by Don Siegel, was deemed too violent and got a theatrical release. One of the early TV movies was 1966’s Fame is the Name of the Game, starring Tony Franciosa as an investigative reporter for a magazine. This would be the basis for The Name of the Game (1968-71), an early example of “the wheel.” Franciosa, Robert Stack and Gene Barry rotated as the leads of the series, which concerned the magazine empire headed by Glenn Howard (Barry). A key figure at Universal television, who is not remembered much today, was Richard Irving (1917-1990), a producer-director. He oversaw a Universal Western series (Laredo), which aired on NBC from 1967 to 1967. Irving also produced and directed the 1968 television movie Prescription: Murder, where TV audiences were first introduced to Lt. Columbo (Peter Falk). The same year, he produced and directed a TV movie with international intrigue titled Istanbul Express, starring Barry, Senta Berger and John Saxon. Irving remained a booster of Columbo. He directed another TV movie with the detective, 1971’s Ransom for a Dead Man, which finally sold Columbo as a series. The Universal TV operation cruised throughout the ’70s. In the early 1980s, it had another hit with Magnum: P.I. But things got tougher that decade. Universal excelled at one-hour dramas and TV movies at a time things were changing. In 1990, MCA sold itself to Japan’s Matsushita Electric. It would be bought and sold over the years before being acquired by Comcast. There are plenty of reasons to enjoy 1959’s North by Northwest, one of Alfred Hitchcock’s best thrillers. Among them: a slick performance by Cary Grant. Eva Marie Saint as the heroine, James Mason as the villain, Martin Landau as the villain’s main assistant, Ernest Lehman’s script, Bernard Herrmann’s music, etc. The purpose of this post, though, is to point out the wealth of character actors, especially for those familiar with 1960s and 1970s television shows in the U.S. Hitchcock’s 136-minute film provided plenty of parts, albeit small in most cases, for busy character actors. Leo G. Carroll (The Professor): Carroll, by this point, was something of a Hitchock regular, having previously appeared in Rebecca, Suspicion and Spellbound. Here’s he appears as “The Professor,” a high-ranking official of U.S. intelligence. It’s a preview of his performances as Alexander Waverly in The Man From U.N.C.L.E. Jessie Royce Landis (Roger Thornhill’s mother): Landis was born in 1896, just eight years before Cary Grant. She steals almost every scene she’s in here, especially when she’s skeptical of her son’s wild story of spies. Her career spanned decades. Edward Platt (Thornhill’s lawyer): At his point, Platt was six years away from his best-known role, The Chief in Get Smart. Ken Lynch (Chicago policeman): Lynch showed up as gruff cops (he had a recurring role on the 1970s show McCloud as a New York cop) or gruff villains. 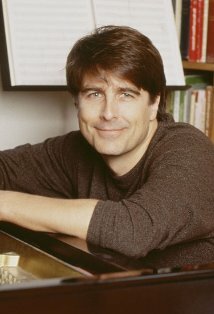 With 189 acting credits in his IMDB.COM ENTRY, he never lacked for work. Malcom Atterbury (Man at Bus Stop): The busy charactor actor (155 credits in his IMDB.COM ENTRY) only gets a few lines as he chats with Cary Grant’s Roger Thornhill in the middle of nowhere. But Atterbury’s observation about the crop dusting plane sets up a classic sequence, which would be an influence in the Terence Young-directed From Russia With Love. Lawrence Dobkin (U.S. intelligence official): He’s one of the people who participates in a meeting chaired by The Professor. In the 1970s, he’d double as a director on various series as well as being a character actor (including being the villain in the pilot of The Streets of San Francisco). Les Tremayne (Auctioneer): Blessed with a smooth, silky voice, Tremayne remained busy for decades, including a part in the 1953 version of War of the Worlds. Olan Soule (Assistant Auctioneer): Another actor blessed with a smooth voice. He had a slight build, but an enormous voice, ensuring he could get work frequently. His many voice-only roles included playing Batman in cartoons produced by Filmation and Hanna-Barbera. 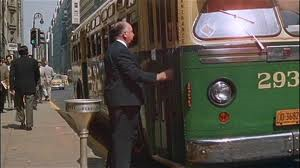 Alfred Hitchcock (Man at New York Bus Stop): One of Hitchcock’s more prominent cameos, he misses the bus immediately after his “directed by” credit. And no this is not a comprehensive list (sorry, Edward Binns and Ned Glass, among others). This trope came up repeatedly. (Trust us, this blog surveyed a lot of reviews on both sides of the Atlantic.) Yet, in a lot of ways, SPECTRE’s humor content was closer to “Alfred Hitchock-Ernest Lehman humor,” as realized in the 1959 movie North by Northwest. 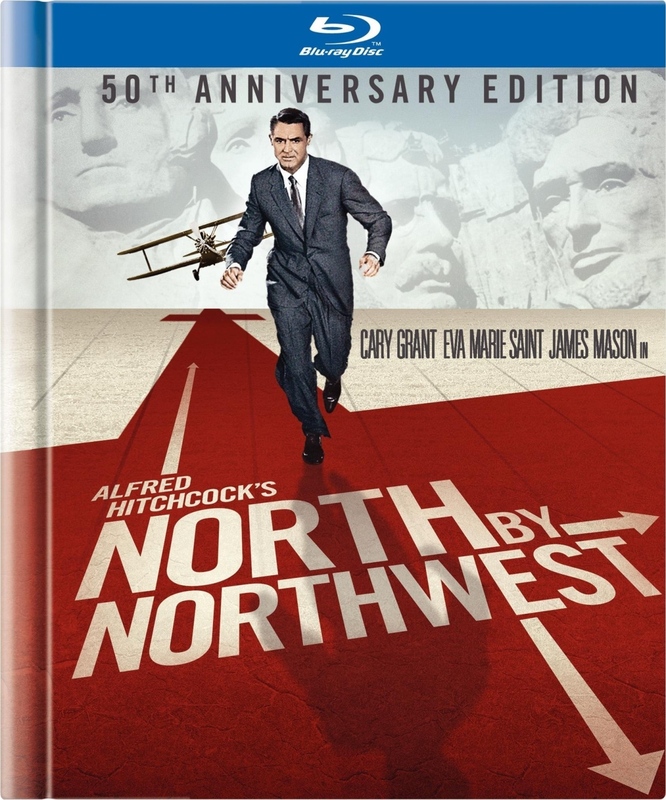 Without going into too much detail, North by Northwest concerns the adventures of New York advertising executive Roger O. Thornhill (Cary Grant), who suddenly finds himself in the midst of a Cold War adventure involving spies from all sides. Sounds like very serious stuff. And it is. But there’s also some humor, similar to SPECTRE. SLAPSTICK: In SPECTRE, the main example of slapstick humor involves a hapless driver of a Fiat in Rome, with Bond (Daniel Craig) tailgating him while trying to evade Hinx (Dave Bautista). The Fiat driver eventually touches (slightly) a post, causing his air bag to deploy. In North by Northwest, Thornhill has been forced to drink an entire fifth of Bourbon by the lackeys of lead villain Vandamm (James Mas0n). The thugs intend to make it look like Thornhill had a fatal auto accident while drunk. But Thornhills revives enough to drive off. At one point, two of his car’s four wheels are over a cliff. In a closeup, Grant looks at the camera while his character is drunk and not entirely sure what’s going on. MORE SUBTLE HUMOR: In SPECTRE, Bond has amusing exchanges with M (Ralph Fiennes) and Q (Ben Whishaw). In North by Northwest, Thornhill — who finally knows everything — gets away from his “American Intelligence” minder the Professor (Leo G. Carroll). He gets out of his own hospital room and enters the room of a woman patient. “Uh, uh, uh,” Thornhill says, wagging his finger. He then ducks out of the room. In a 2009 post, this blog argued that North by Northwest provided the blueprint for 1960s spy entertainment. SPECTRE is an attempt to replicate that, as well as the “classic” Bond film style, while including some of the drama of 21st century Daniel Craig 007 movies. SPECTRE has its faults. This blog’s review, while liking the film overall, cited the “reveal,” the length and the last third of the film as demerits. Still, SPECTRE doen’t remotely resemble a comedy, as some critics seemed to think it did. It’s an attempt, as we’ve said before, of blending “classic” and Craig-style Bond. And it’s humor content is comparable to what Hitchcock liked to introduce in some of his films. SPECTRE isn’t up to the standards of North by Northwest. That’s still a nice standard to shoot for. Are cameos in movies worth it? This fall, fans of The Man From U.N.C.L.E. television series wondered if the show’s original stars would have a cameo in a new film version underway. Some fans were vocal, arguing that of course they should. It’s not known if such a cameo took place for the U.N.C.L.E. movie. (Robert Vaughn said more than once he’d welcome the opportunity; David McCallum made comments suggesting he wouldn’t participate.) The subject though got this blog to thinking: are such cameos worth it, or are they more of a distraction for a finished film? The king of such cameos was director Alfred Hitchcock, who made a cameo in his more than 50 films. They can be something of a mixed bag. In North by Northwest, he appears right after his “directed by” credit as a man missing his bus in New York City. The appearance, in effect, is an extension of the main titles designed by Saul Bass. At this point, the viewer hasn’t been watching the actual story of the film. In other cases, Hitchcock’s appearance almost draw attention to themselves. In 1969’s Topaz, there’s an airport scene. The viewer is drawn to Hitchock, in a wheelchair, guided by a nurse. Hitchcock meets a man, abruptly stands up and shakes the man hand before walking off. By this point, more than 20 minutes of the story have been told. You could argue it’s a distraction, although it’s over pretty quickly. None of these questions have right or wrong answers. Fan tastes vary. Hitchcock fans, for example, take pleasure in trying to spot the director’s cameos. In any case, it’s likely such cameos will continue in movies. Skyfall and Oscar nominations: glass half full or empty? For James Bond fans, this year’s Oscars ended a long 007 drought. Yet, fans on social media had a very mixed reaction. On the bright side, Skyfall secured five nominations, the most for any 007 film. The previous best for a Bond movie was 1977’s The Spy Who Loved Me with three. Not so bright: no nomination for Best Picture and no nomination for director Sam Mendes. In other words, fans wanted more. Here’s a look at some of the reaction we saw among 007 fans via social media. Thomas Newman got nominated for best score but John Barry never did for a 007 movie? Outrageous! Newman has been nominated for several movies, with Skyfall being the latest. John Barry won five Oscars but never got nominated for a 007 score, even though he established the Bond music template. A couple of thoughts: in theory, Oscar nominators are supposed to only consider scores for a single year of movies. The 2012 nominators weren’t in a position to do a “make good” for Barry because, well, he’s no longer alive. Also, there’s probably very little overlap between those who voted to nominate Newman and those who passed over Barry in the 1960s. It doesn’t mean that Newman’s score is better than Barry’s work. Skyfall deserved a Best Picture nomination. Why didn’t it get one? There had been a buzz that Skyfall could have gotten in. The Academy of Motion Pictures Arts and Sciences can nominate as many as 10 movies for the Best Picture honor. U.K. BOOKIES GAVE SKYFALL EVEN ODDS. The Whatculture Web site on Jan. 3 offered up TEN REASONS IT THOUGHT SKYFALL WAS A CONTENDER FOR A NOMINATION. It didn’t happen. The academy only nominated nine movies. The academy tends to be pretty tight lipped. But keep this in mind: Alfred Hitchcock, Cary Grant and Peter O’Toole never got a competitive Oscar (Grant and O’Toole did eventually get honorary Oscars). 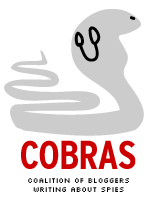 With any group, such as the academy, there are internal politics, relationships, etc., that come into play. If you really believe Skyfall (and for that matter director Sam Mendes) really deserved a nomination, well, don’t let the Oscars get you down. Lewis Gilbert, in the documentary Inside You Only Live Twice, referred to Freddie Young (who photographed the fifth 007 film) as one of the great artists of British cinema. The director frames the shot, but the director of photography, though his or her lighting, greatly affects the look of a film. It’s not uncommon for DOPs to make the jump to directing. Music, meantime, has a big impact on the emotional feel of a movie.